Two of the skinniest books in the world are entitled “What Women Know About Men” and “What Men Know About Women”. The skinniest book in the Foxborough Public Library has to be “What People Know About Drew Bledsoe”. At this time in his career, you’d be hard pressed to find anyone who knows what to do about this guy, perhaps including Da Man himself. Bledsoe perhaps expected to be somewhere else right now, installed as someone else’s franchise quarterback. The Patriots perhaps expected to be in line for about four first round picks and winners of six of the next eight Super Bowls. What we instead have is Bledsoe still in New England, and no one out there who seems to want Bledsoe, and that may also include his current team. What a comedown. The elder President Bush went from something like a 90 percent job approval during the Gulf War to being beaten out by some obscure governor who campaigned with a tenor saxophone and gave new meaning to the fine art of philandering. Billy Ray Cyrus went from the C&W; version of Elvis Presley with Achy Breaky Heart to someone that even line dance freaks have never even heard of. Jane Swift will soon retire to lovely Williamstown to raise her newsworthy twins and be all but forgotten two weeks after her successor is sworn in. And Bledsoe has gone from future Hall of Famer to someone nobody seems to want anymore. Sometimes, life really is not fair. Basically, three single people and one large group of people sit in limbo as this matter lingers on with no end in sight. The problem essentially is not how quickly to bring closure, but how to bring any closure at all. Forcing a deal or acquiescing to something less than true value for Bledsoe may be a worse thing than, say, doing nothing at all. Trouble is, someone has to realize what is the right thing to do and stick with the plan. And that’s where we come in. Here’s a plan. Or, in other words, here are some directions as to how to handle Bledsoe. Maura Bledsoe may not need these, and we certainly hope not. Place the onus squarely on the rest of the league. Stand fast. Hold your ace until it’s the right time to play him. Demand the first round pick for 2002 and hold firm. Someone will pony up, and before the NFL Draft. The league is either posturing, playing stupid or being stupid. It is not prudent to just walk up to Pioli and hand over your future just to make a quick deal. If, say, the shoe was on the other foot, and the Patriots were pursuing a possible franchise quarterback, you might be a little concerned if Pioli started off by offering draft picks that mortgaged your team’s future and negated the plusses acquiring the stud QB would bring to your team. Or, if your team offered up someone like Ty Law, Lawyer Milloy or Antowain Smith for Da New Man, you’d quiver quite a bit. Think about that if you get mad that Cincinnati isn’t ready to hand over Takeo Spikes or Corey Dillon without delay. Give the league time to feel the market out. Someone will flinch soon. Pioli will get something that will reflect Bledsoe’s real value in due time. It has basically come down to whoever blinks last. That will be the team that lands Bledsoe, and the Patriots will have one of the best drafts for a Super Bowl champ in recent memory. Don’t be a genius and an idiot at the same time. If there is any acrimony between you and Bledsoe, smooth it over. Kiss and make up. Because if for some stupid reason that nobody in the NFL meets Pioli’s (and perhaps yours also) price, that means that Bledsoe is staying put. The man is still under contract here, and cannot be simply brushed under the rug like a Damon Denson or a Sedrick Shaw. Get Bledsoe on your good side, and figure out how to use him in ’02. At least let him compete for his starting job back. Because if he stays around, he becomes a most valuable commodity. Remember, the opening game of the season features a team that employs Lee Flowers. This guys eats quarterbacks’ ankles. Tom Brady could be gone for a while during Week 1. Bledsoe has to be made to feel that he at least can try to get his old job back, even if that may not be possible. Or, he needs to be made to feel that he should be at the ready if Brady turns out to be the biggest one hit wonder this side of Mark Rypien. That responsibility falls squarely on Belichick. In addition to that, Belichick simply needs to sit down with Bledsoe and try and make him feel good about being a Patriot if he stays. Bledsoe has gone from the signature Patriot to a literal has-been. Repairing hurt feelings like that will take a bit more than Belichick’s bland and impersonal style. As long as Bledsoe stays a Patriot, it is incumbent upon Belichick to maintain good relations with a very valuable player, even if he is in backup role. Okay, okay. We all know. How can we possibly expect you to feel good about any of this stuff? Going from established starter to established backup? Sitting by and watching a league show total disinterest? Watching Brady all season long go from someone who couldn’t secure a starting job from the future third baseman of the Yankees to Super Bowl MVP? And you expect Bledsoe to be happy about all this? Or happy about possibly staying a Patriot? Bledsoe went through an entire year of showing more professionalism and humility than anyone on the planet. Many people anointed Bledsoe as the MVP of the 2001 Patriots. Nobody ever handled such an adverse situation with more dignity and grace than Bledsoe handled last season. But Bledsoe perhaps figured that he’d be gone by now, and would by now be on his way towards resurrecting his career. What felt acceptable last season won’t feel anywhere near such in ’02. Bledsoe could perhaps be forgiven if he did grouse and pout in ’02. It’s still unprofessional, and would be poorly received by the football community in general. But Bledsoe does need to examine himself and deal with the possibility that the league simply doesn’t see a market for him, and that the only place for him is in Foxborough as Brady’s backup. And if that be the case, Bledsoe needs to maintain more professionalism than ever. The most important thing Bledsoe needs to do is to stay ready. The door that slammed shut in his face could re-open at any time. Well, what can you really do? Nothing, of course. A better query would be related to how you feel about Bledsoe, Brady, Belichick, Pioli, and this whole process. Maybe you want Bledsoe to go, maybe you don’t. Maybe you want the Patriots to flinch and reduce their demands. Maybe you think Brady is the real deal, and maybe you think that Brady just got lucky this past year. You as a fan can’t do anything except think and feel. So, here are some things to think and feel about. This is an organization that just won a world championship two and a half months ago. This bunch has completed the transition from being the league buffoons to really knowing what to do. This bunch has their own plan, and didn’t think to ask us about ours. Whatever happens with Bledsoe will have been the product of several right things happening in concert with one another. 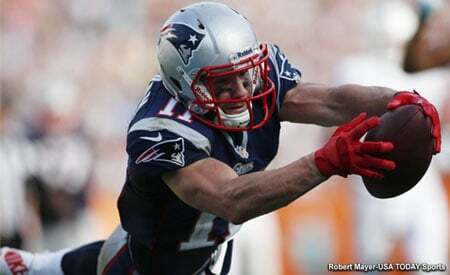 All Patriot Nation can do is relax and watch this thing play out. For all of you who are obsessed with mock drafts, that may be too tough to do. You will simply have to bide your time. A deal may not go down until Draft Day itself. A deal may not go down at all. One way or another, Belichick will get his men in the draft. Instead of predicting this year, try sitting back and watch the fun of dealing and posturing. And be happy that you’re a spectator and not a participant. Because when someone like Bledsoe is the bait, sooner or later someone will stick their neck out. And something will go down. Except this time, “going down” won’t refer to Bledsoe’s luster or reputation. This entry was posted in Uncategorized on April 13, 2002 by Bob George.